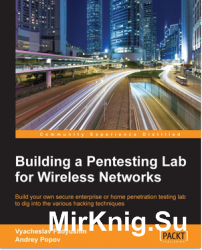 Build your own secure enterprise or home penetration testing lab to dig into the various hacking techniques Starting with the basics of wireless networking and its associated risks, we will guide you through the stages of creating a penetration testing lab with wireless access and preparing your wireless penetration testing machine. Andrey Popov is a security consultant and penetration tester with rich professional experience and a diverse background in infrastructure and application security, information security management, and ethical hacking. He has been working for a market-leading company along with another security professional since 2007.